Did your elementary school cafeteria have ice cream bars for sale for dessert? Mine did, and one of my favorite treats to buy after lunch was one of those strawberry shortcake ice cream bars. Do you remember them? They had the strawberry ice cream center surrounded by a layer of vanilla ice cream all covered in those delicious, addicting shortcake crunchies. The best. I loved those crunchies. They were my whole reason for buying those ice cream bars. And for looking to dessert at school lunches period! 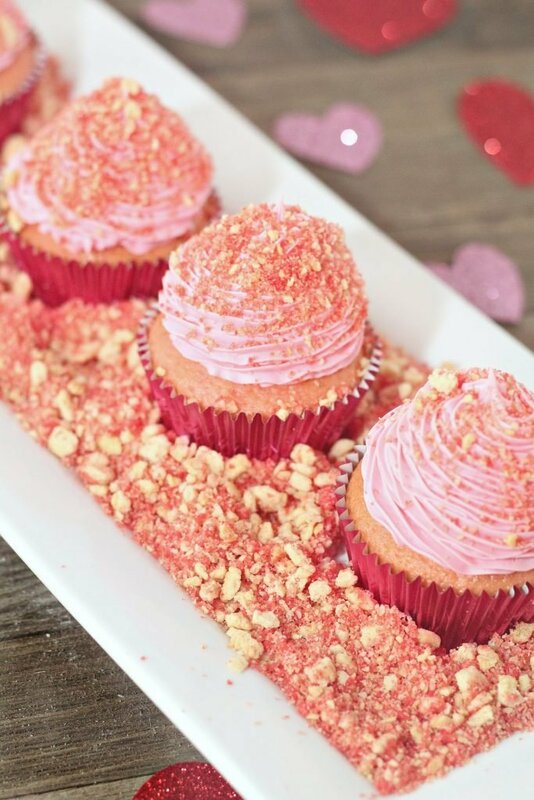 Well, these strawberry crunch cupcakes are topped with my take on that crunchy strawberry shortcake coating. And let me tell you, I can eat this homemade crunch coating by the spoonful. It is every bit as addictingly delicious as the coating on the ice cream bars. 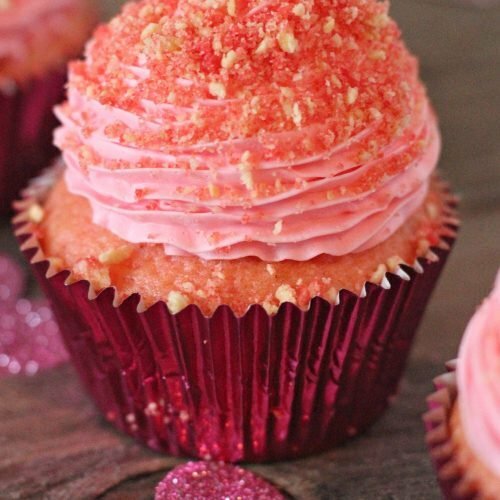 These cupcakes are a bit more involved than some of my other recipes, but I promise you, they are worth it. And we will take some shortcuts to get there so we aren’t working unnecessarily hard. To start, we are going to make the strawberry cupcakes from a box mix. 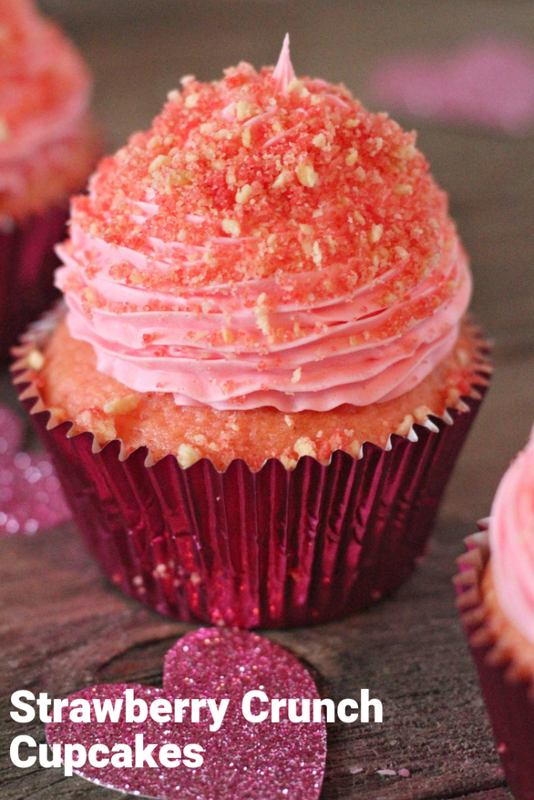 Because the cupcakes, while important, take a backseat to the all important icing and topping. Those we aren’t going to cut corners with. After you bake your cupcakes and let them cool, assemble the icing. In a large bowl, beat together the cream cheese, butter, and half of the package of jello mix. Once mixed, add in the heavy cream. Then add in the powdered sugar gradually until the icing reaches the desired consistency. 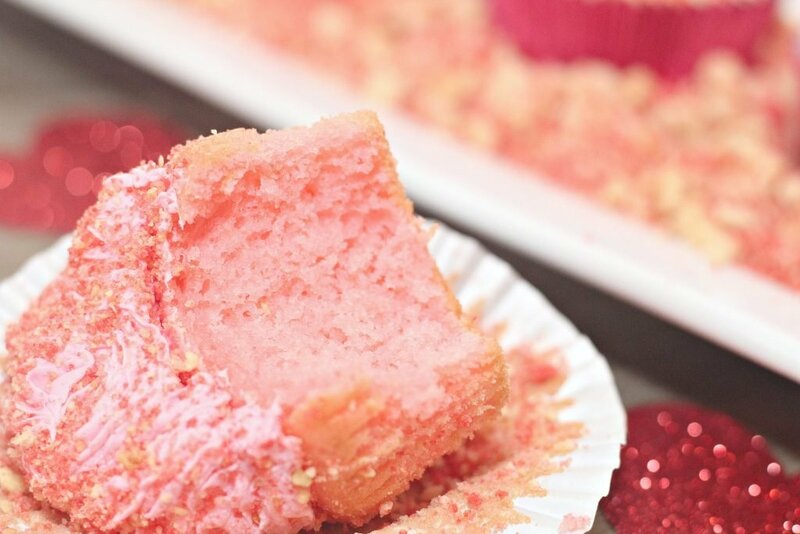 Lastly, add a few drops of food color to make the icing so perfectly pink. The icing should be able to hold its shape without being too dense to work with. Once the icing is finished, spoon it into a piping bag fit with a 1M piping tip. Pipe the icing onto each cupcake. A couple of tips to pipe your icing and make the pretty swirls. First make sure you twist the top of the bag closed. If you don’t you will have a big mess. Next, use even pressure as you squeeze the piping bag. If you don’t, the swirl will be kind of uneven and lumpy. And lastly, don’t worry too much about icing imperfections. You are going to cover them up with the crunch. To make the crunch, grind up the golden Oreos in a food processor. Then add in the remaining jello mix and pulse to combine. Lastly, add in the melted butter, a little at a time until you see the mixture become a little moist. Then resist the urge to eat all the crunchies with a spoon while you let it firm up a bit. 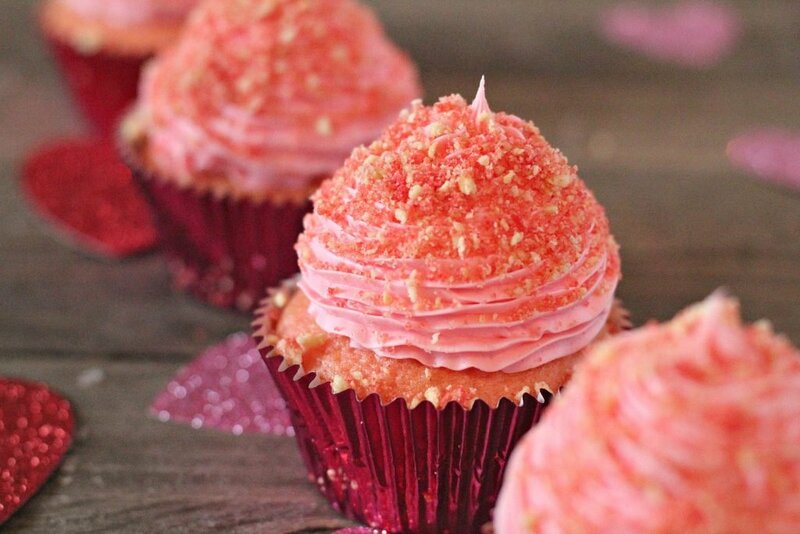 Then break it into crumbles and spoon on top of your cupcakes. The result? 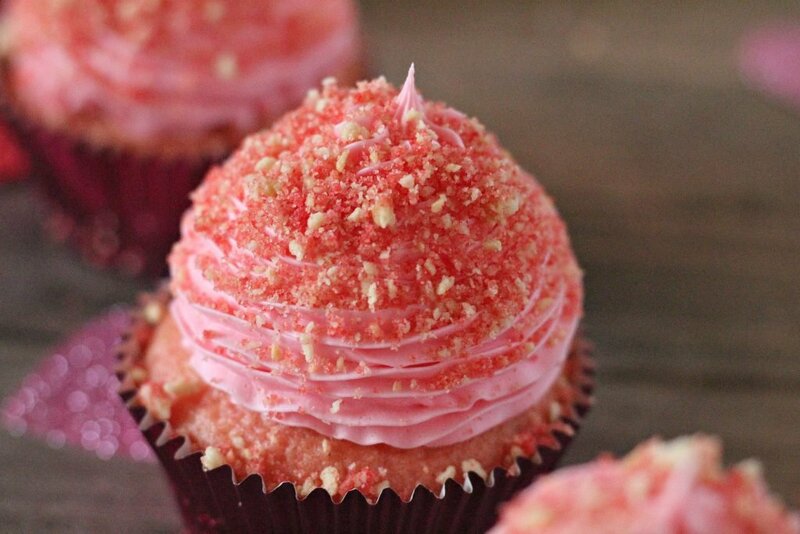 A perfect pink strawberry crunch cupcake that is light and fluffy and topped with irresistible icing and crunchies. 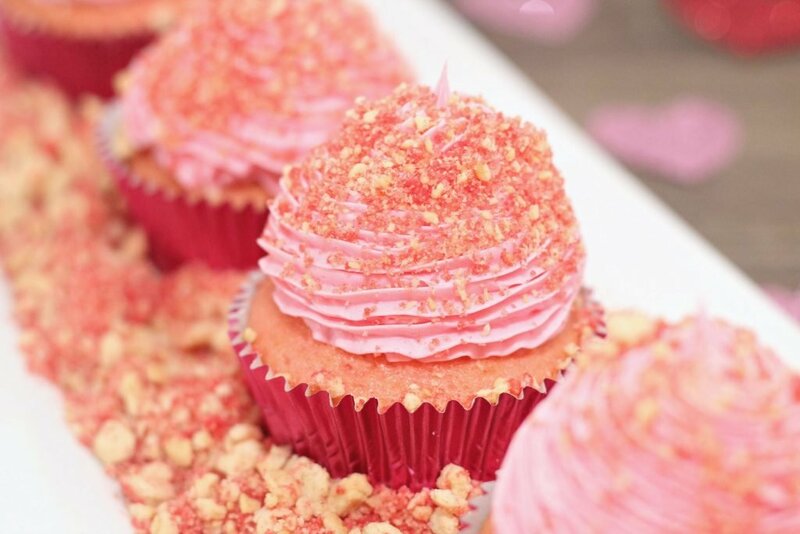 Truly the perfect way to sweeten up Valentine’s Day. 1 and 1/2 Sleeves of Golden Oreos Remove cream. Start mixing together your cake mix, oil, eggs, and water. Line a cupcake pan with liners, and fill 1/2 way. In a large mixing bowl, beat together cream cheese butter, and jello mix. Add in heavy cream, and gradually add in powdered sugar until you reach desired thickness. 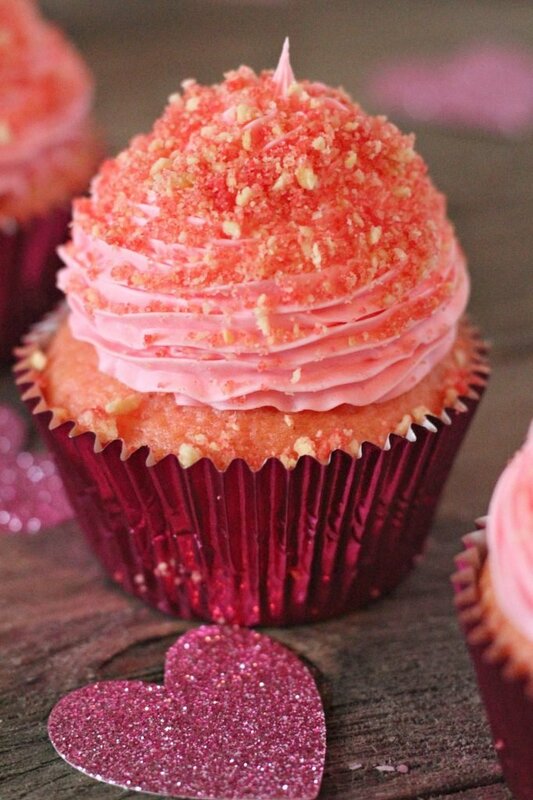 Add in food coloring and mix until pink. Attach your pipping tip to your bag, and fill bag with pink icing. Starting in the middle of your cupcake work your way out and up with icing. In a food processor grind up your oreos. Add in strawberry jello mix, and combine. Add in melted butter and process until mixture becomes moist. I let mine sit and stiffen a bit, about 1 hour. Stir with a spoon to break up. So beautifully creative! I’m too old. We didn’t have the ice-cream bars or many or even any treats we could buy but thanks to your recipe I can have these – a thousand times better, I’m sure! I love all the tips you added! Thanks for sharing with us at Fiesta Friday!